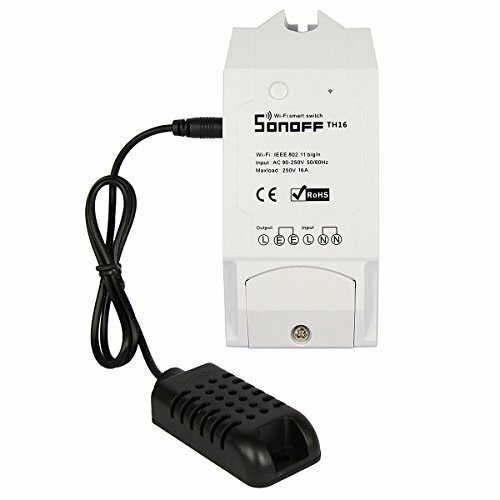 Smart Plug remote temperature and humidity monitor. WiFi switch supports presetting the range for temperature and humidity. When the temperature and humidity of the environment falls within the range, it will automatically turn on or off the connected devices. * Supports remote turn on/off connected appliance and presetting temperature and humidity to turn on/off on eWeLink APP. and set a temperature to turn on/off several types of other switches (such as Sonoff, Sonoff RF). * In Auto mode, the switch can not be turned ON/OFF by the button manually. * In Manual mode, the switch can be turned ON/OFF at any time.The preset timers can work as usual in Auto mode. 2. Wiring the smart socket and plug your sensor into the jack, power up your device. your device will be registered by ewelink,then you can use it. Any question or problem pls feel free to contact us.